Day 1 Our first day will begin at 8AM, meeting downtown with pick-ups at previously arranged locations. We’ll head northward rounding Knik Arm and stop at the headquarters for the 1000 mile Iditarod Sled Dog Race. The displays and short video here give a good insight into dog mushing in general, as well as the life-style and the commitment that it takes to train for and run the Iditarod itself. Before pushing northwards, we’ll have lunch in the old Teeland’s Department Store building, sitting on what was the center of Wasilla in the settlement days. We’ll then return to the Parks highway, entering the great Alaska Range of mountains and on to Denali National Park. Flightseeing tours of the mountain are available just outside of the Park and are very highly recommended (cost approx. $400/person) –sliding between towering peaks and over monstrous glaciers, this is an indescribable glimpse of a world that few experience. If the weather isn’t cooperative, we’ll have another equally good opportunity on Day 3. Dinner is just outside the entrance of Denali National Park, with lodging in Healy a few miles north. Day 2 After an early breakfast, we’ll head to the new Park Visitor Center for an overview of what we’re about to experience. There’s a great movie and extensive interpretive displays. Nearby we’ll pick up our scheduled concessionaire shuttle bus, the only mechanical means of public access to the interior of the Park. During the 66-mile trip to the recently reconstructed Eielson Visitor Center, there are some of the best chances anywhere, of seeing caribou, moose, Dall sheep, bears and wolves in the wide open vistas, with the vehicle stopping for wildlife or scenic photos whenever anyone would like. It’s what the park is famous for the world over. Hopefully too, the mountain will be “out”. . . It’ll be a full dose no matter what animals and views grace the experience, begging for a leg stretching short hike on the great network of trails near the Visitor Center upon return. Then it’s a bit of leisure in “Glitter Gulch” the less than complementary name for the proliferation of businesses just north of the Park entrance. Accommodations for the night are back at the White Moose Lodge. Day 3 Turning back south to reach Cantrell, brings us to the western terminus of the beautiful Denali Highway. 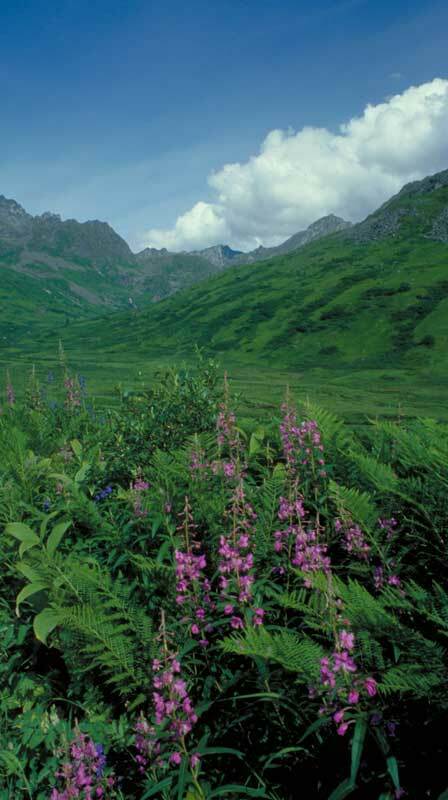 A 135-mile gravel road across wide valleys, alpine tundra and breathtaking scenery, the Denali “Highway” is open only during the summer months and is the only road through this remote area. Crossing glacial river and lake country, wildlife viewing opportunities abound in this large stretch of wilderness inhabited year-round only by the occasional trapper and wilderness hermit. We’ll make a mandatory stop at the Gracious House, an old homestead on the road and one of the last occupied; most succumbing to the increasing unwillingness of most folks to work so physically hard for so little monetary gain. We’ll later cross the Susitna River and follow the winding road over ancient glacial eskers and over the Maclaren Summit (elev. 4082 ft), the second highest point on the Alaska road system, stopping for photos or a short hike as time and weather permit. We then travel through the Tangle Lakes Archeological District, thought to be the principal corridor through which the earliest peoples passed to populate the rest of the Americas after making their way over the Bering land bridge from eastern Asia. The Richardson Highway, following the old Valdez-Eagle trail, leads us southward through Glennallen and Copper Center. We’ll stop at the new Visitor’s Center of our nation’s largest national park, Wrangell-St. Elias, for an introduction to this uncommercialized jewel more than twice the size of Denali. The contrasting lack of crowds and regimentation is more than apparent. Just a few miles away is our lodging in a historic roadhouse dating from the earlier days. Day 4 Just next door is a great little museum for after breakfast. After that, the scenic Edgerton Highway leads to the old railroad town of Chitina at the confluence of the Copper and Chitina rivers. There’s also a great little Park history intro in the nearby log cabin of one of the early settlers. From here we will travel the tortuous abandoned railroad grade 60 miles through the mountains back to the tiny town of McCarthy in the heart of Wrangell-St. Elias National Park. At the end of the gravel road we’ll grab our overnight bags, leave the van, and cross two forks of the Kennicott River (by footbridge) to reach the near-ghost town of McCarthy on the other side a half mile away, the only means of surface access in the months when the river isn’t frozen. Excellent flightseeing tours of the area may also be available from the McCarthy airstrip that give an incomparable overall perspective ($150-250/person). After a short hike onto the glacial terminal moraine, and having dinner at the McCarthy Lodge, the night will be spent in the historic “Old Ma Johnson” Hotel. Day 5 A van trip up the remainder of the road four miles to the abandoned company town of Kennicott, takes us to where we’ll breakfast overlooking its namesake glacier. Walking allows an almost unbelievable exploration of an entire town sitting much the way it was when the mine closed in 1938. The Park Service has been busy for the last several years, renovating, shoring and adding interpretive displays to the historic buildings, as well as the incredible 14-story mill building itself. Kennicott is truly a ghost town without equal, due to its remoteness and fortunate lack of vandalism. A couple mile hike to the Root Glacier allows those interested to clamber onto the face of an active glacier. Others might choose the optional tour of the Mill building (surprisingly fascinating). Lunch is overlooking all this incredible scenery before our van shuttle back to McCarthy. Some might even opt for a return by the old Wagon Road, past the old cemetery. Dinner is back at The Golden, with the attached bar a must for lingering with the locals and getting a feel for those that call this home for the summer or a lifetime. Lodging is back across the street at the “Ma Johnson”. Day 6 After breakfast, we again cross the footbridges to the van for the beautiful trip to Valdez across Thompson Pass. Stopping at Tiekel River and the Worthington Glacier, we’ll climb toward the pass where it’s been known to snow almost a thousand inches in the winter. It’s quite breathtaking in summer too. Descending through Keystone Canyon, a dramatic waterfall-filled passage to the ocean, the challenge of the terrain shows why the route took many years to discover and pioneer. In the late afternoon, we’ll have an opportunity to explore the wonderful museum and stroll the streets. Dinner will be on the town in Valdez with accommodations at a nearby bed and breakfast. Day 7 After breakfast we board the Alaska State Ferry for the beautiful ride across Prince William Sound. We should see many local creatures including murres, puffins, and sea otters, with a good chance of humpback and maybe even orcas or killer whales, as we weave amongst the many islands of the Sound before reaching Whittier. Here we will be reunited with our van and drive 2.5 miles through the Whittier Tunnel, the longest highway tunnel and the only one combining both rail and vehicle use in North America, which connects Whittier with the 1964 earthquake-destroyed community of Portage. Just out of the tunnel is the fine Portage Glacier Visitor’s Center, and an easy short hike to view the Byron Glacier. From here we will head through the Kenai Mountains to the tiny end-of-the-road frontier town of Hope on Cook Inlet. Far older than Anchorage, this first gold rush community in Southcentral Alaska is still a place of log buildings and an atmosphere that can only be experienced. It’s the Alaska many have in mind from stories past. Lodging is in the cozy log cabins of Discovery Cabins, on the edge of rushing Bear Creek. Day 8 Following a hearty breakfast, we’ll head down the road to Seward and board the tour boat to head out into the Gulf of Alaska for the spectacular Kenai Fjords National Park, passing through the Chiswell Islands Refuge. Here we will view calving glaciers up very close in our small vessel and cruise the rugged coastline to view a tremendous concentration of wildlife including orcas and humpback whales, sea otters, sea lions, porpoises, eagles, and many different kinds of sea birds. 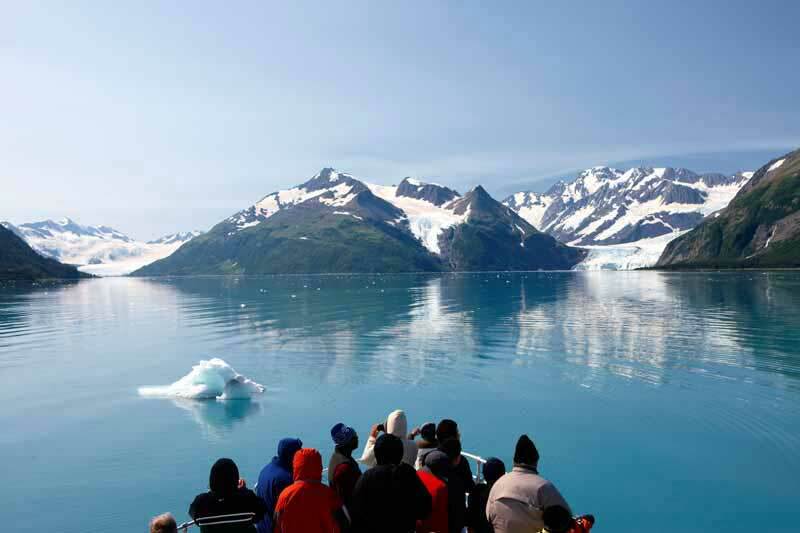 It’s one of the best one-day experiences in Alaska. Returning late afternoon we’ll head north through the mountain lake community of Moose Pass and back to Hope. If inclined after dinner, we’ll have a walk to the historic Seaview Bar down on the waterfront to meet some of the local “wildlife”. Or, you might just like to poke around the old settlement and see the magnificent views of the mountains bordering Cook Inlet, before lodging again for the night at Discovery Cabins. 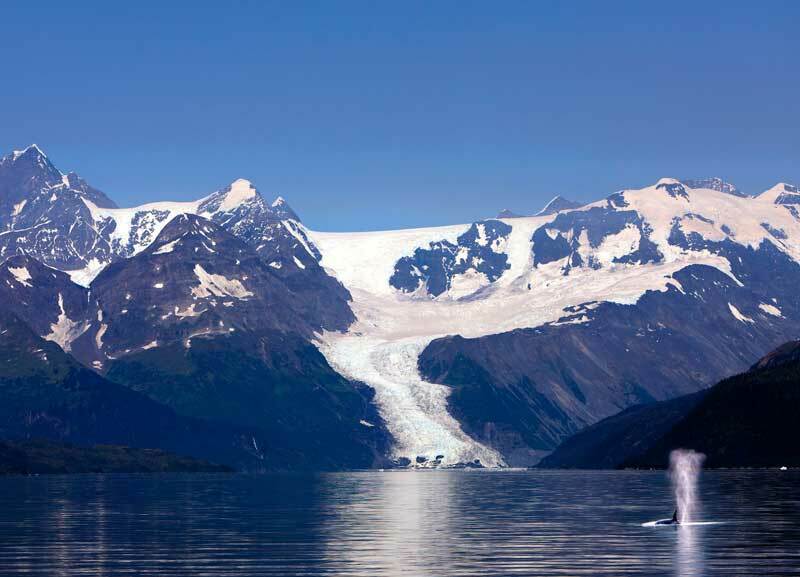 In nine days, this wonderful itinerary offers a representative cross section of Alaska from the varied wilderness interior to the rugged maritime environments, traversing three major mountain ranges and hundreds of miles of marine sanctuary and coastline in this tour accessible to all. By being small and mobile, we can leave the crowds behind and explore treasures unavailable through other means, allowing a true sense of self-discovery. 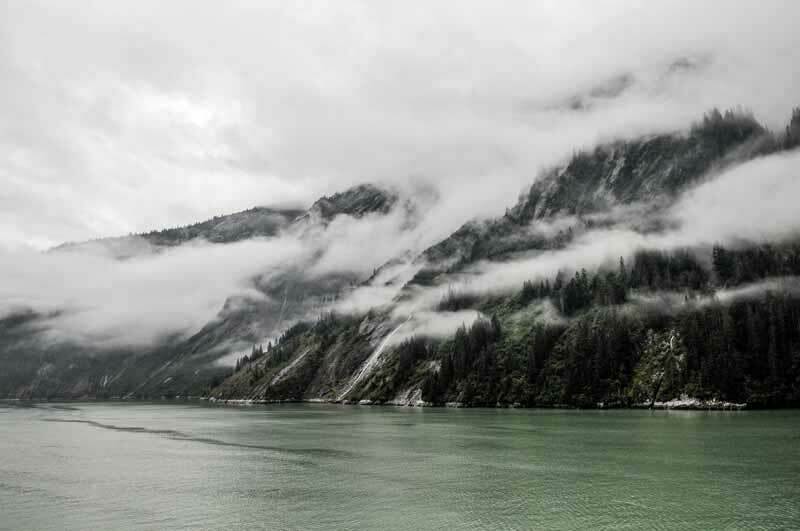 From visiting many unspoiled frontier towns and the national parks of Denali, Wrangell-St. Elias, and Kenai Fjords; to exploring a remote ghost city, to traversing famous Prince William Sound to view whales, bald eagles, and glaciers; this overview of Alaska goes far beyond what the merely conventional tourist will ever see. While many means exist to visit the wild North, the only way to truly experience it is to get off the beaten track. This 9-day itinerary provides a bit more leisure than our venerable shorter version, both offering a wonderful option to enable a tremendous and personal overview, without sacrificing several weeks or all idea of comfort. Staying each night in lovely and unique accommodations and dining in restaurants, this tour still retains a very definite spirit of adventure in the places and people we visit. If longing to see some of the real Alaska, but don’t care to camp, then this is the tour for you.